T. Smith and Brian are always reading something real deep. You know that I love novels, but these guys love books like The 48 Laws of Power, The 48 Laws of Seduction, anything by Pablo Coehlo and so on. They are always reading to become better and better people. 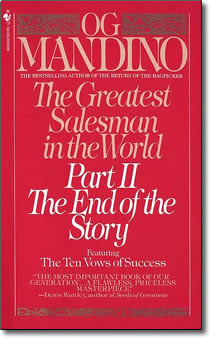 I was talking to T. Smith a few days ago, and he told me about the book titled The Greatest Salesman in The World by Og Mandino. This opening page had me hooked, and I eagerly devoured this book! 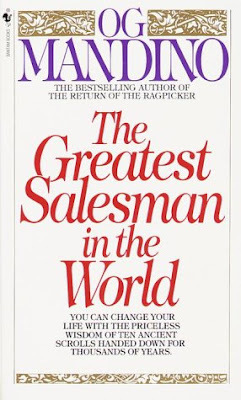 In this book, Pathos is "The Greatest Salesman in the World." There are secrets to his success that are printed on ten scrolls. Pathos was told that "through some sign I would recognize the individual to pass the scrolls even though it was possible that the individual would not that he was seeking the scrolls." It was revealed to Pathos that Hafid was the person whom he should reveal the secret to his success to. As Pathos sent Hafid on his journey he told him to state: "Failure will never overtake me if my determination to succeed is strong enough." This line pushed me to read on with great anticipation. All ten of the principles are definitely principles to live by. I wrote them all down, and I am planning to place them in my house and on my desk at work and read them over and over until they become apart of me. They are principles to live by. After finishing this book, I called T. Smith, and he did not answer, so I called Brian, and he knew exactly what I wanted. We talked about this book and it's greatest. Then he had to go, because he needed to get a workout in. (What a focused man!) But, before he hung up, I was told that I needed to read Part II of this book. Later, I talked to T. Smith, and we talked about this book and a whole lot of other stuff for awhile, and we both agree that this book is a 'game changer.' He confirmed that I needed to read Part II of this book. In Part II, Hafid is sixty years old. His wife has died, and he has spent fourteen years in isolation from the world. He suddenly realizes that "I am a healthy child of sixty! My lungs are clear, my flesh is firm, my vision is excellent, my heart is as alert as it was at twenty. I believe that I am prepared for a second life....!" Hafid passed the scrolls on to another person and soon realized that the scrolls had been lost at sea. So, he went into the woods, and he rewrote the information. The ten scrolls in Part II are slightly different than the first ten, but they are equally divine. For those of you who say that you do not have time to read, these books are less that one hundred pages and are fairly easy reads. You got to read these books. 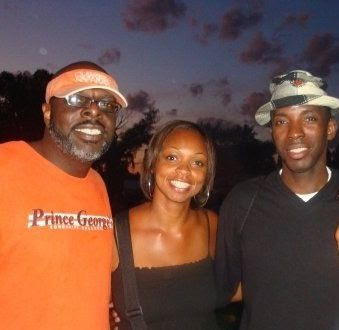 I am so Thankful that I have well-read friends like T. Smith and Brian to recommend great books to me!!! It's a multitude of life lessons in this book. If you like giving gifts then this is a great one! Thank you J.S. for being on pointas usual. My birthday is in February. Love it. I think I'm goin to the bookstore now. T.Smith showed up on my blog! I am honored. Thank you for this gift. Imani, thanks for reading and leaving a comment. T. Smith and Brian are awesome right? I guess T. Smith will having me reading E_myth shortly. 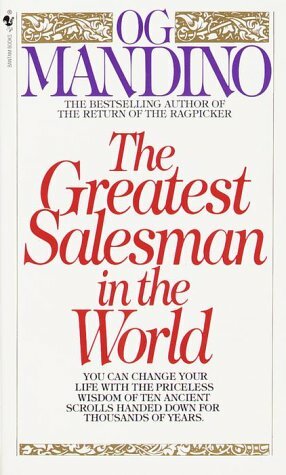 Please let me know what you think of the Greatest Salesman in the World Parts I and II. Jackie, always a pleasure talking with you about "the people". I appreciate your voice and your spirit. Let's continue to spread the message of love, peace, harmony, and understanding. Sensei Imani...I need them vegan bean pies on deck. Don't forget about us vegan customers. T. Smith...we back in the lab!!! Carole and Elizabeth, thanks for stopping by. paid option? There are so many options out there that I'm totally overwhelmed .. Any suggestions? Thanks a lot!